The origin story of the madeleine is about as accurate and reliable as my 61% statistic. In theory, at least according to most stories, the treat is named after a girl named Madeleine who worked in the kitchen of a famous nobleman in Lorraine a few hundred years ago. She might have been a cook in the castle of Commercy for Cardinal Paul de Gondi in the 17th century, or she might have been Madeleine Paulmier, a cook for the Duke of Lorraine in the 18th century (who was father-in-law to Louis XV). It is possible the Duke's daughter, Maria Leszczynska, brought them to Versailles where they became popular. It's equally possible that some woman named Madeleine developed them or brought them back from her pilgrimage in the Way of St. Jacques Compostelle, or that she was a cook who made them for the pilgrims along the way to Spain. Most people assume there's some Compostelle connection because of the shape of the cookies -- in the form of a scallop, known as St. Jacques in French, and closely linked to this famous pilgrimage. It's also entirely possible, of course, that nobody named Madeleine had anything to do with it, as one of the earliest descriptions of "cakes à la Madeleine" was in 1758 from a cook for Lord Southwell, an Irish refugee in France. Or, in the 19th century, it was invented by Jean Avice, a pastry chef for Prince Talleyrand who used a scallop-shell aspic mold (like a gelatin mold) to make the cakes. I think I can say with 61% certainty that the madeleine was invented in the 17th, 18th, or 19th centuries by a French man or woman who was, or was not, named Madeleine. I am 99% certain that while a madeleine looks like a cookie, it's technically a cake, in that it's made with a traditional genoise batter. The mini, shell-shaped butter cake is sometimes flavored with almonds or lemon zest. It's pronounced "ma-duh-LEN" and is not to be confused with the famous French character from children's literature, Madeline, pronounced "ma-duh-LINE," at least in English. As far as I know, Madeline never eats madeleine, which is a missed opportunity for some wholesome, old-fashioned fun with cannibalism jokes, if you ask me. "No sooner had the warm liquid mixed with the crumbs touched my palate than a shudder ran through me and I stopped, intent upon the extraordinary thing that was happening to me. An exquisite pleasure had invaded my senses, something isolated, detached, with no suggestion of its origin. And at once the vicissitudes of life had become indifferent to me, its disasters innocuous, its brevity illusory – this new sensation having had on me the effect which love has of filling me with a precious essence; or rather this essence was not in me it was me. ... Whence did it come? What did it mean? How could I seize and apprehend it? ... And suddenly the memory revealed itself. 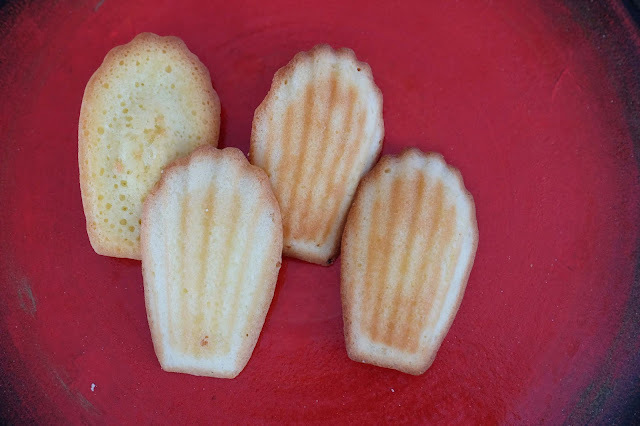 The taste was that of the little piece of madeleine which on Sunday mornings at Combray (because on those mornings I did not go out before mass), when I went to say good morning to her in her bedroom, my aunt Léonie used to give me, dipping it first in her own cup of tea or tisane. The sight of the little madeleine had recalled nothing to my mind before I tasted it. And all from my cup of tea." I can't say that's what goes through my mind when I eat a madeleine; I usually think "Yum." 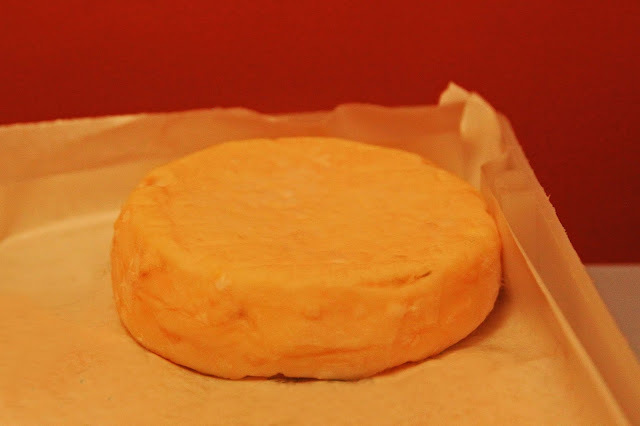 Le Géromé is a cows' milk cheese that is closely related to Munster -- not the American mild, bland Muenster, but rather the pungent, stinky-feet, orange-rind, French Munster. Both are made from cows milk, and both come from the northeast corner of the country, in Les Vosges, a department in the region now called the "Grand Est" ("Great East") that includes the area historically known as Lorraine (as in Alsace-Lorraine). Le Géromé comes from a village called Gérardmer which partly explains the cheese's name. If you look at it, it seems like it should be named after a Gérard rather than a Gérome, but in fact it turns out that in the local dialect, with the local accent, the word Gérardmer is pronounced nearly like Géromé. Le Géromé could be made from raw milk, but it's often made from pasteurized milk. This is confusing because the seemingly-related AOC-status cheese Munster-Géromé must be made from raw milk, so in this way, they are not actually the same cheese. What is similar is the stink. It's a big disk about 11-20cm across and 2.5-4 cm thick, washed with salt water on the rind during the 5-12 week aging process to form a stinky orange crust and a pungent, creamy interior. The cheese also comes in a cumin-laced version. According to stories, the cheese was created by Irish monks living in the Munster region during the Middle Ages. The city of Munster, created soon after, paid the taxes it owed to the Duke of Lorraine by offering this very cheese (well, perhaps not this exact specimen, but this very type). Like its cousin, Munster, this cheese should never be brought into enclosed spaces (trains, cars, movie theaters) and opened in public, unless you wish to make yourself a social pariah. I speak from experience. Here is yet another story for which the Compostelle cheese would be perfect -- because it has the same shape (scalloped shell) as a madeleine cookie. But since I've already written about Compostelle, I set out to find a cheese that was, like the madeleine, from the Lorraine area. I'm extra pleased that it's golden-colored, has a person's name like the little cake, and has a questionable history that also involves being created for/ served to nobility. The Duke of Lorraine (same position, not necessarily same person) is even involved in both the story of the madeleine and the story of the cheese.